Monster High 13 Wishes Doll Collection: Howleen Wolf discovers a genie lamp and turns Monster High upside down. Monster madness ensues, particularly when poor Lagoona Blue is turned into a freshwater sea monster. But along the way, the ghouls make two new friends and possible BFFs (beast friends forever, of course. ): Gigi and Twyla. Gigi is the daughter of the Genie and so she must grant the wishes of her finder – whether good or bad. Daughter of the Boogie Man, Twyla is not what she seems. Often shy and misunderstood, she hides under normies' beds to capture their nightmares rather than adding to them like her dad. It's spook-tacular entertainment. Doll comes with pet, diary, brush, doll stand and character-specific accessories. Each sold separately, collect them all. Lagoona Blue doll shows off a gore-geous new look, as seen in the spine-tingling movie Monster High 13 Wishes! This creepy-chic sea monster features a freshwater makeover, with a pink-and-black dress and sheer blue overlay. 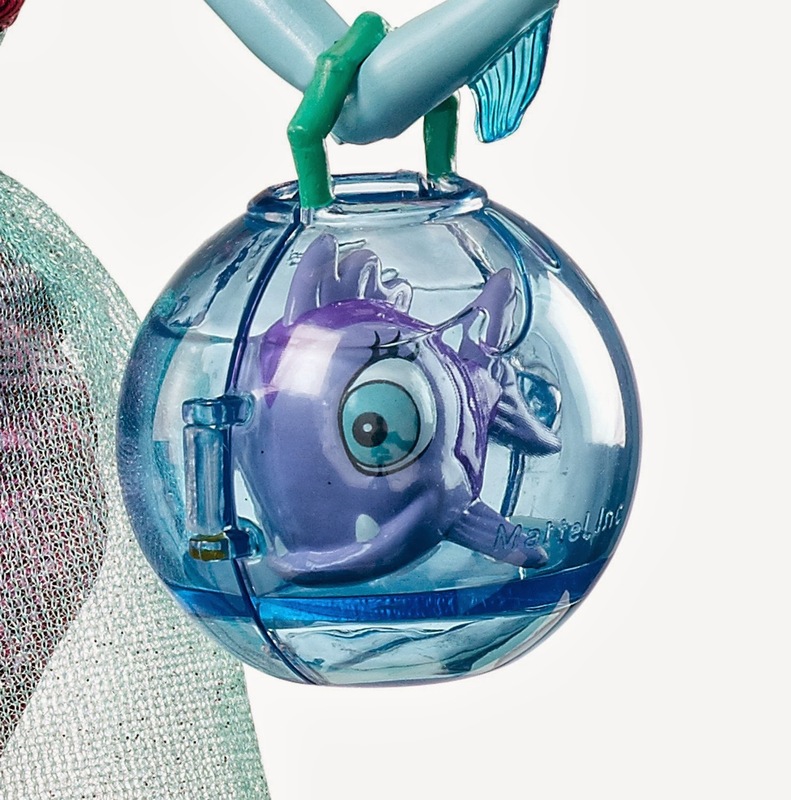 Plus, she comes with her signature fishbowl purse for her pet fish, Neptuna. Monster High - Muñeca 13 Deseos - Lagoona, la muñeca Monster High Lagoona con 1 mascota, 1 diario, 1 cepillo, 1 peana para la muñeca y accesorios específicos. Lagoona es parte de la aventura Monster High "13 Monstruo-Deseos" y se convierte en un monstruo marino. The ghouls of Monster High are off on another exciting adventure! This time, Howleen Wolf finds an ancient genie lantern in the attic and accidentally wreaks havoc on Monster High! Gore-geous Lagoona Blue doll is dressed for adventure in sea-sational fashions and accessories. Plus, she’s fully articulated, so your own ghoul can pose her in lots of fun ways. In the monstrously entertaining movie, Lagoona Blue is transformed from saltwater to freshwater, so now the fin-tastic fashionista has a new look to match. This special Lagoona Blue doll makes fashion waves in her strapless pink-and-black dress with a sheer blue overlay. She accessorizes her shimmery ensemble with wedge sandals, jewelry, and goggles. 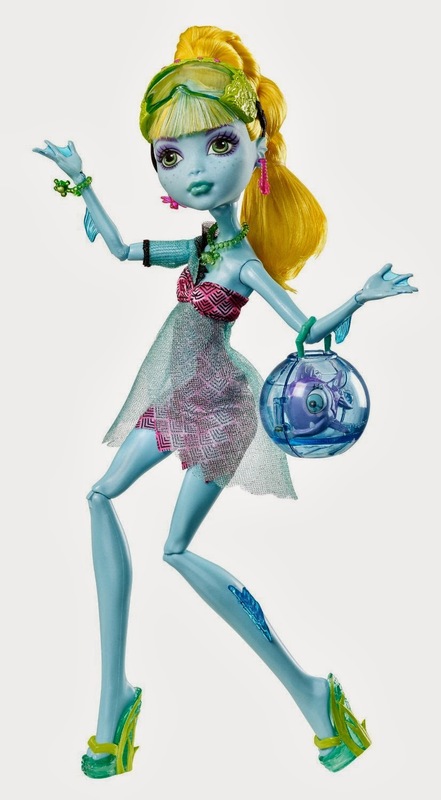 Lagoona Blue complements her aquamarine complexion with boo-tiful makeup and a vibrant yellow hairstyle. She comes with a personal diary, a hairbrush for touching up her ’do, and a doll stand for striking different poses. Plus, ghouls will shriek with delight at the pet fish in her fishbowl purse. It’s a classic genie story — with a Monster High twist. When Howleen Wolf discovers a magic lantern, she’s granted 13 wishes instead of three. She makes some good choices and some bad choices, and creature chaos soon ensues. It’s up to the ghoul friends to save the day — and all before the Haunt the Casbah Dance. Girls will love recreating favorite movie moments and inventing new adventures with Lagoona Blue doll. ¡Howleen Wolf descubre una lámpara con un genio y revoluciona el instituto Monster High! La locura se desata, ¡sobre todo cuando la pobre Lagoona Blue se convierte en un monstruo marino! Pero al fin, las monstruas conocen a dos monstruo-amigas nuevas: Gigi y Twyla. ¡Estas monstruas son aterradoramente divertidas!